You can do this itinerary in the reverse order too. Bu the Somwarpet towards Subrahmaniya is preferred, since you'll be very tired after the trek and quickly want to get to a lodge/hotel/restaurant or catch bus. 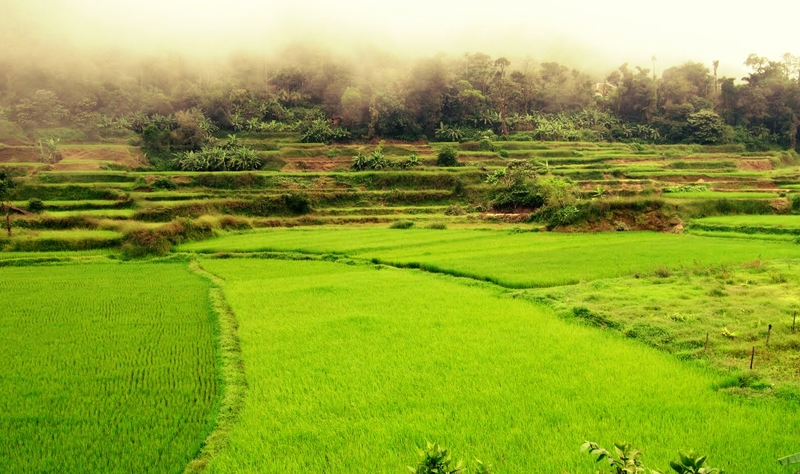 Subrahmaniya town is right next where your trail ends, whereas Somwarpet is a good 25km away. By the way from Subrahmaniya you can catch a train also to Bangalore (see Kukke Subramanya and Bangalore to Kukke Subramanya). This is quite straight forward route you can get a direct connection (bus or Train) to Subrahmanya from Bangalore. (see Bangalore to Kukke Subramanya for options and driving directions). The trail begins very close to the temple in the town. If you are driving from Bangalore to Subrahmanya, you can park your car/bike at the parking area around the temple or at the lodge premises you've checked in. The first part of the trek from Bidahalli to Hegdemane is 5kms of walk along the normal asphalt road. Enroute we come across the Kumardhara river flowing underneath a bridge.Get refreshed up in the cool water and prepare for the trek applying lime, tobacco salt etc to protect from the dreaded leeches. As you keep moving forward with paddy fields on the sides of the road and Cardamon strewn across the road on plastic sheets to be dried, you see the peak ahead of us.We reach Hegde Mane a very small village that had greenery everywhere and a major chunk of it was the paddy fields. Simply a feast to the eyes. As we move further we slowly and stealthily engulfed in mist. "Paddy fields we come across while on the way to hegde mane"
As you continue further you come across Kumarahalli temple from where by taking a right turn the actual trail starts. The route is mud laden for about 2 kms.We reach the forest dept check-post where the entry fee wI'll be collected with a written memo saying that they are not responsible in any way if attacked by wild animals.On crossing the checkpost, you see the hanging bridge the stream flowing beneath and the last place for filling the bottles with water. . The change in scenery begins instantaneously after crossing the bridge.We enter the dense canopied jungle of Pushpagiri wild life sanctuary with very little sunrays strewing upon the dried leavesd and twigs which was wet due to incessant rains. Beware of leeches in these areas. The trail is clearly marked by yellow colored sign boards. The three boulders which is inclined at a moderate angle and continued moving towards the next boulder which was much steeper. The skies opened up and navigating through the boulder is very hard so we circum navigated around the edge by helping ourselves upward by holding on to the bushes. Everything look so green and lively. 2 hours of journey comprising of two more boulders we will reach a point where a signboard mentioned 0.75km to Kumaraparvata (Pushpagiri), we will reach the top of the tallest peak in that range. When it was almost dusk the clouds cleared up giving a GLORIOUS view of the sunset. A fiery red ball of flame and just beautiful.A thing to be remembered for lifetime. The early mornings will have a beautiful view of the clouds above the lower mountain ranges around us.There were 2 layers , one layer in lower elevation than us and one which was at higher elevation. From the top you could actually see the western ghats forests spread to such a huge distance, so many hills, mountains in view. Start you return journey to Kukke Subramanya . Since there was no demarcation, the same uphill route should be taken.The water point other than the bridge is at the peak and the direction is marked on a boulder with yellow paint, hence the return journey is along that water path. The initial part of the descend will be pretty much along a path of the water falls so it will be pretty slippery. At one point we will reach a point where there will be a huge rock. A small steep route is found along the right side of the boulder from the top. Very steep and slippery. After trekking for an hour, we reach the famous Kallinamantapa – a stone structure capable of holding up a tent. Water bottles are filled up from the nearby trough. This route leads to Bhattara mane amidst a place called Girigadde. The route is mainly filled with grasslands spread over the hills.This view is in complete contrast to what we had witnessed the previous day and some breathtaking drops. This stretch seems to be under the rain-shadow region and only grass grows here. But the path is strewn with small rocks and boulders which strain our ankles and knees during the descent. An hours trek leads to forest guards office whereone has to display the obtained permission letter. Another 5 mins we reach Bhattara Mane. After having meal here, you can start your journey. Same down the lane we again encounter a leech infested forest and with rains in between the progress on the way to Subramanya. The trek ends here. Another 1 km journey to Kukke Subramanya town. 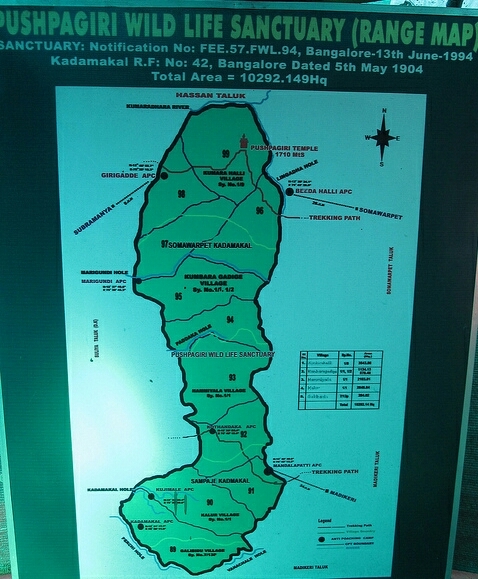 "MAP OF TREK FROM SUBRAMANYA SIDE"
One can reach Subramanya from Bangalore by bus or train. There are direct buses from Bangalore to Subramanya which can be booked online at KSRTC websites. There are also direct trains from Bangalore to Subramanya. However, Subramanya bus stand is nearer to the Subramanya town from where the Kumara Parvatha trek begins. If you go by train, Subramanya railway station is around 20 Kms from Subramanya town. So you will have to take a jeep from the railway station to Subramanya town. Above is the map of Kumara Parvatha trekking route. 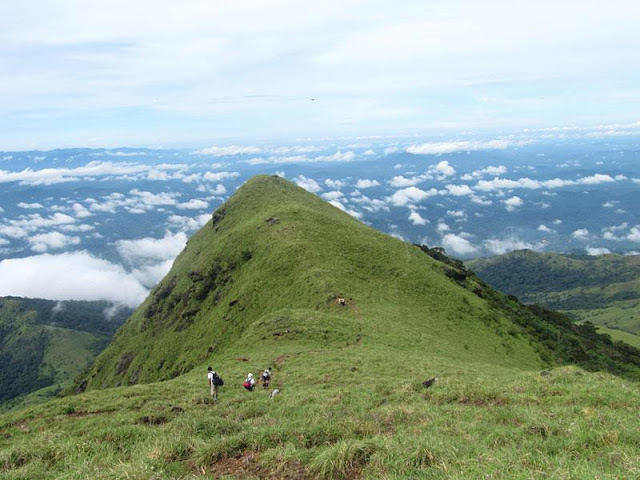 Here is a link to Kumara Parvatha Hiking Trail Map. You can easily download this map and use GPS to guide yourself while climbing the trek. For more details refer the map. 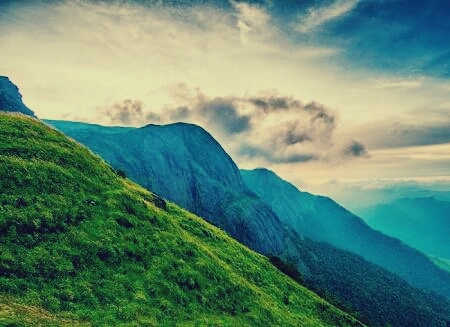 However, forest department allows you to go to the peak but you will have leave behind your tent and camping gears at the forest department office. You will have to return by evening and pitch your camp there. Have early breakfast from the shops in the same street and also pack some lunch if you do not want to pay at Bhatru mane. Enjoy at the peak and return and pitch camp near forest department or at Mantapa. Use Snuff powder in socks and shoes to avoid them. Keep on looking for them in shoes/socks time and then. Sleepy small town, cold and windy. Luckily they have public toilets for temple there, get freshen up. Let local shops open. Eat, get packed heavily for lunch. Take some spare food too. Ask local for the route to Kumara parvatha. After an half kilometer walk, you will see a board to Kumara Parvataha. Old & dark woods; smell it; feel it; walk as much as you can before sun becomes too hot. Cover as much of distance as possible before sun says a warm “hi”. Sun shows its face now. Rays filtering through woods dripping, scattering over the trail. It is a mirage and an eye-candy. Heat & sweat. Wipe themThe twin peaks, Marigundi and Shesha Parvatha from a distance inviting you. You will have to cross them to reach Kumara Parvatha. Bhatru mane from this point is just 5-10 minutes away. Now, if you are planning to stay there at Bhatru mane, you can go and explore places like sunset point (near by). Have breakfast and start again to Kumara Parvatha. 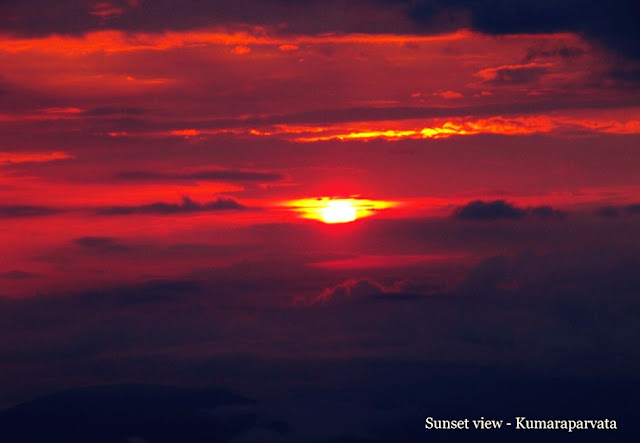 From Bhatru mane, it takes 5 mins to reach sunset point. 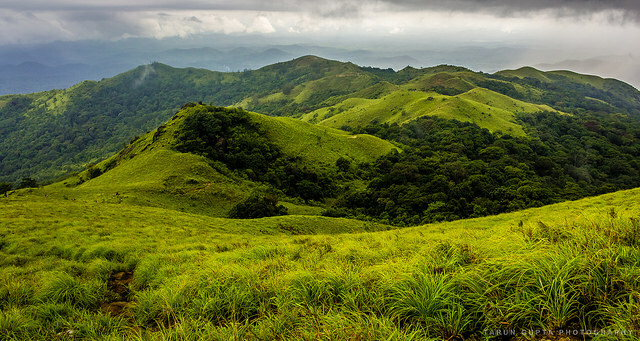 Still the panoramic view of western ghats are awesome here.It’s a photographer’s paradise. Sit on the chairs there. Lonely; realize; resound; wonder; enjoy; see a philosopher and nature lover inside. A true place where you can discover outside and within.Never ending magnificent view of western hills range. Walk little further and you reach at forest check point. Pay the fees to enter Pushpagiri wildlife and move on ahead. Take the entry passes and enter the wildlife. Keep moving ahead soldier. Enjoy the beauty around. Grasses; trees; flowers; meadow; hills- Life must be so beautiful here. A four pillars structure. There is a water source here. (fill bottles here). All around is the grassland and flowers. I encountered almost 10-20 types of different varieties of flowers. And grasses are of around 1-2 feet of height. From here begins the reality check of how hard hiker are you. The gradient of 40-50 degree of steepness. Man! you have to push yourself and others too. Lean forward. Did your back hurt? Are you trying hard to maintain the center of gravity? Stop. Look behind for others. Push them. pull them. Watch your steps; don’t let them find a cramp or bent. The view at Marigundi and Shesha Parvatha are breathtaking. “Get up guys let’s move on, before it gets too dark, cold and windy”. Sitting their after lot of calf muscles exercise was most soothing part of the trek. Put your hands on ground. Push yourself up. -It will be time to move on. From Shesha Parvatha, one more trek through leech forest but little downhill. That’s the only relief. Though, final part of the trek requires last uphill trek to reach Kumara Parvatha. we come across a very small stream with little flowing water. Climb down or almost run for 15-20 minutes and then climb up for 30-45 minutes and you are at the peak. Removed shoe at little running stream. Collect dry woods. pitch tent; somebody go and fetch water before its too dark. Cover the bags at one place with tarpaulin if you are planning to stay up there for a night.